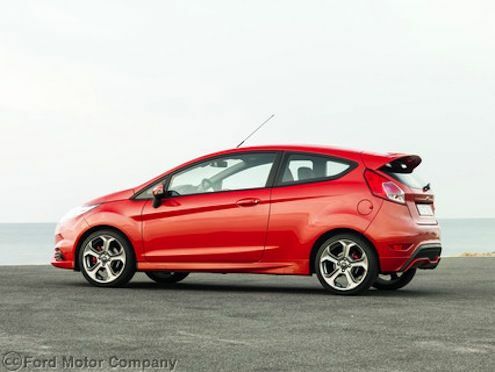 The 2014 Ford Fiesta ST has been well known in Europe and the sizzling hot hatch is making its advance around the globe. Ford will be unveiling the new sporty Fiesta ST at Auto Shanghai 2013 as it’s now ready for the China market. The Fiesta ST is a global car and delivers spirited performance that translates into any language. The new Ford Fiesta ST wears the Sport Technologies badge that is Ford’s global performance brand that was started by the Ford Focus ST earlier this year. What does the global ST badge mean for buyers around the world? All Ford ST models share the same DNA around the globe and it means buyers can expect outstanding performance when they get behind the wheel. And the new 2014 Fiesta ST will give the Chinese a performance hatch that will be fun to drive in the corners. The Fiesta ST has been wildly popular in Europe and the first 2014 model rolled off the production line in Germany in February. European performance enthusiasts have been blown away by the Fiesta ST with the hot hatch’s sizzling performance. What kind of performance can the Chinese expect from the new Fiesta ST? The 2014 Fiesta ST is responsive and can immediately be felt as the driver revs the new four-cylinder engine. The new Ford Fiesta ST packs a punch under the hood with a new high-output variant of the advanced 1.6-liter EcoBoost four-cylinder engine, delivering some amazing numbers: 134 kW of power (180 hp), 240 Nm of torque(177 lb ft), 0-100 km/h in 6.9 seconds, and top speed of more than 220 km/h (137 mph). That’s not bad for a performance hatch that also gets good fuel mileage. The new Fiesta ST gets its DNA from its racing heritage and the technology has filtered down to the production model the global car offers. The Ford Fiesta ST’s 1.6-liter engine combines turbocharging and direct injection to deliver the performance of a larger engine twice its size. The EcoBoost powerplant also features twin independent variable camshaft timing and has been specially developed to provide power and torque worthy of the global ST badge. And the 1.6-liter EcoBoost engine delivers outstanding fuel economy and low emissions to go along with the performance. The innovative design of the engine, mated to a six-speed manual transmission, means that the Ford Fiesta ST is able to deliver top fuel economy. The European variant delivers 47.9 mpg (European combined) and 138 g/km CO2. The powerplant enables 20 per cent fewer CO2 emissions but 20 per cent more power compared to previous generation Fiesta ST. The 2014 Fiesta ST gets a unique suspension with a rear axle featuring increased roll stiffness to improve stability through the corners. The Fiesta ST body sits 15 millimeters closer to the ground for further stability for more spirited driving. The electric power-assisted steering on the Ford Fiesta ST along with modified front knuckle makes for a quicker overall steering ratio of 13.69:1. It’s more direct and responsive than the standard Fiesta. And Chinese buyers will be able to use the three-mode Electronic Stability Program and choose between standard, sport or off. This enables the ST driver to select the amount of electronic aid based on current conditions. The engine and transmission calibration was refined at the Nürburgring Nordschleife over the equivalent of more than 100 laps of the 21km circuit. Ford further subjected the hot hatchback to 7,500 km of race track testing and 5,000 km of high speed testing before it reached production. The new 2014 Ford Fiesta ST will be available exclusively as a three-door hatchback in China, and will be Ford’s first three-door offering in the Asian country. The Chinese can expect a fun global hot hatch that was inspired by the global Ford Fiesta race and rally cars currently competing on the world stage. Look for the Chinese Fiesta ST to be unveiled at Auto Shanghai 2013.